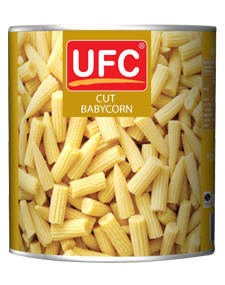 UFC Cut Baby Corn in Brine carefully selected fresh young corns. Perfect size of baby corns are cut and placed in brine to preserve its flavours, textures and nutrients. Corn is rich in carbohydrates, vitamins A, B, C, fiber and minerals. Cut baby corn in brine is ideal to cook in all types of dishes, whether it can be stir-fried, boiled or baked. It does not contain any preservatives and is cleanly sealed in certified packaging (glass jar or can). This product is ideal for both vegetarians and vegans.